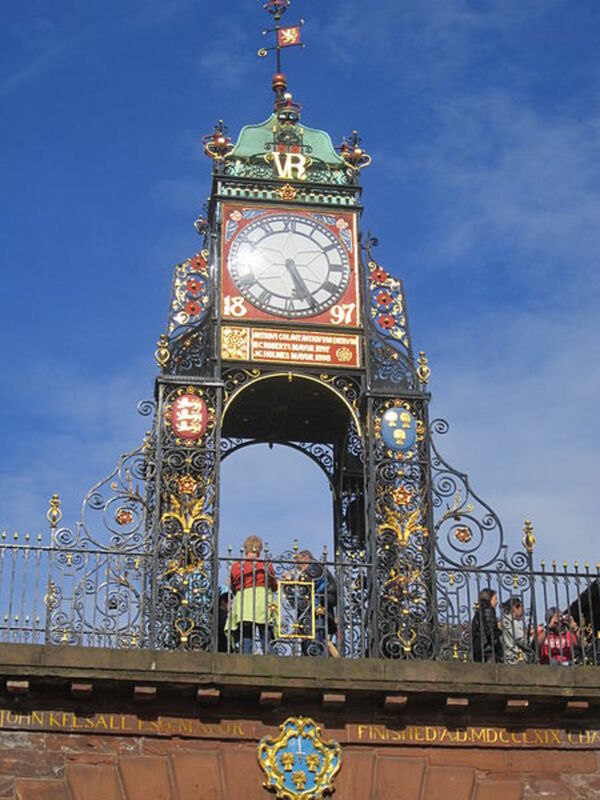 Chester, county town of Cheshire, in the north west of England, stands on the River Dee, not far from both Liverpool and North Wales. 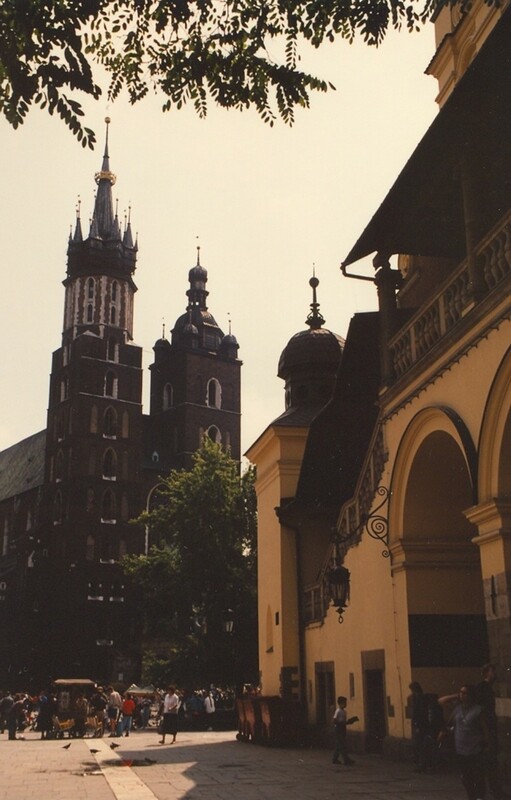 The city is one of the most popular tourist destinations in the country because it has kept many of its medieval features including tiered shopping galleries. There is a lot to see and do - a visit to the cathedral, boat trips on the River Dee or a day at the racecourse. 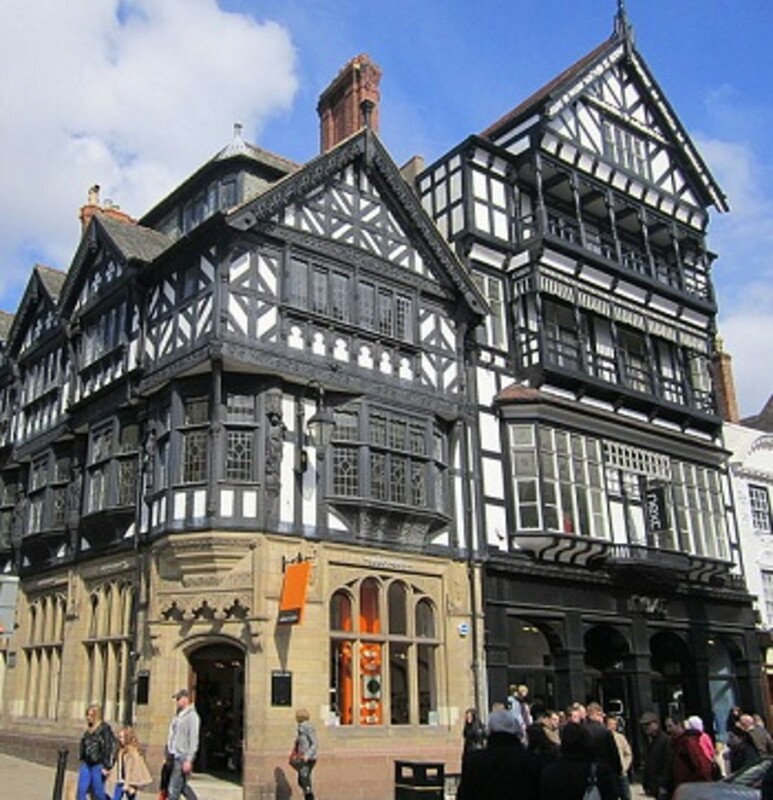 There are museums telling the story of Chester going right back to the Roman period. 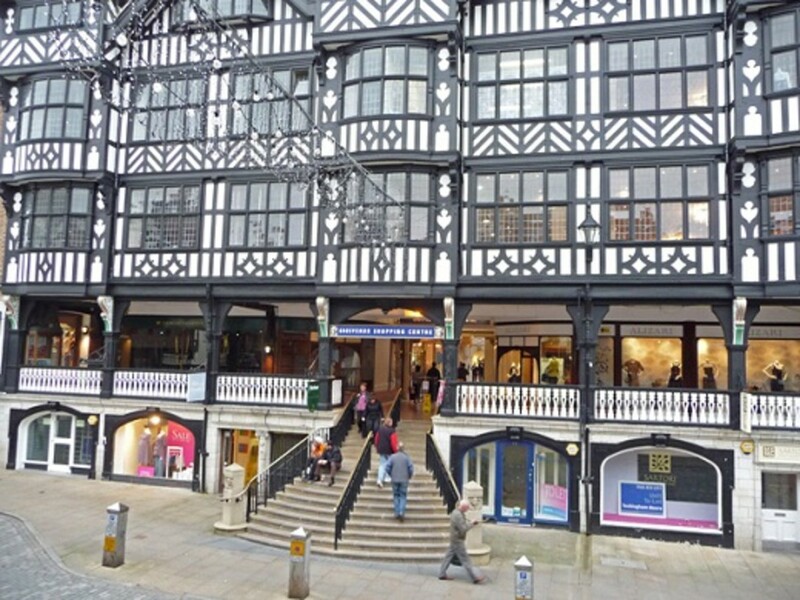 The medieval two tier shopping galleries, known as The Rows, are amongst the most famous of Chester's attractions and are typical of Cheshire's black and white buildings. They line one side of Northgate Street and Watergate Street, where the oldest can be found. Level with the road, the shops are recessed and so provide a covered area for pedestrians to walk alongside them while there is another storey of shops above. Boat trips on the River Dee give a different perspective on the beautiful city of Chester while a tour of the city on an open top double decker bus is a good way to see the major landmarks before exploring them later on foot. Chester Racecourse, the Roodee, holds regular race meetings from the start of the season in May onwards as well as many other events including polo, show jumping and the famous Chester Mystery Plays. 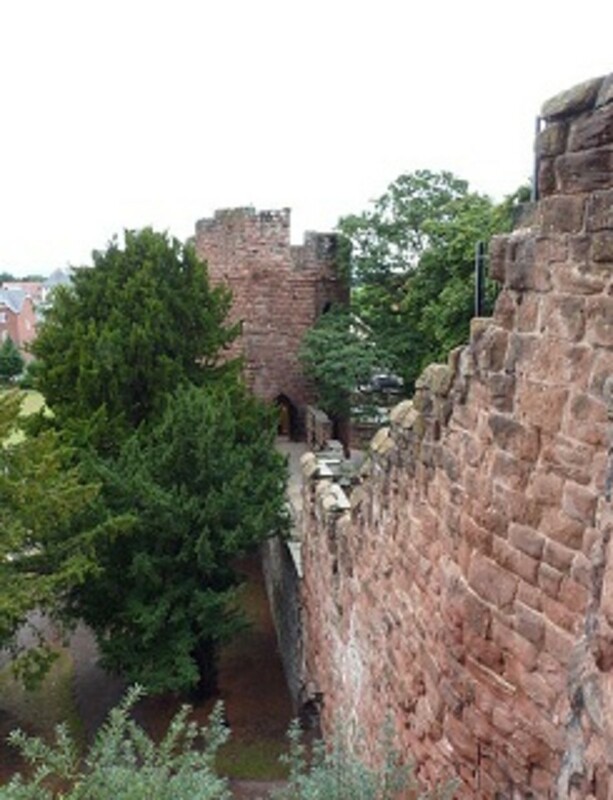 Chester is the only English city to have preserved all of its City Walls and both towers. The Romans first built the walls but they were rebuilt and added to during Saxon and later periods. You can walk right round on the walls, a distance of about two miles. You get great views of the surrounding countryside. Take a look at the King Charles Tower, where Charles I watched the defeat of his army at Rowton Moor in 1645 during the English Civil War. On Eastgate you can see the Eastgate Clock, (see photo below) said to be the second most photographed clock in the country (Big Ben in London is number one). Chester's cathedral church and cloisters form one of the most complete medieval monastic complexes in the country. 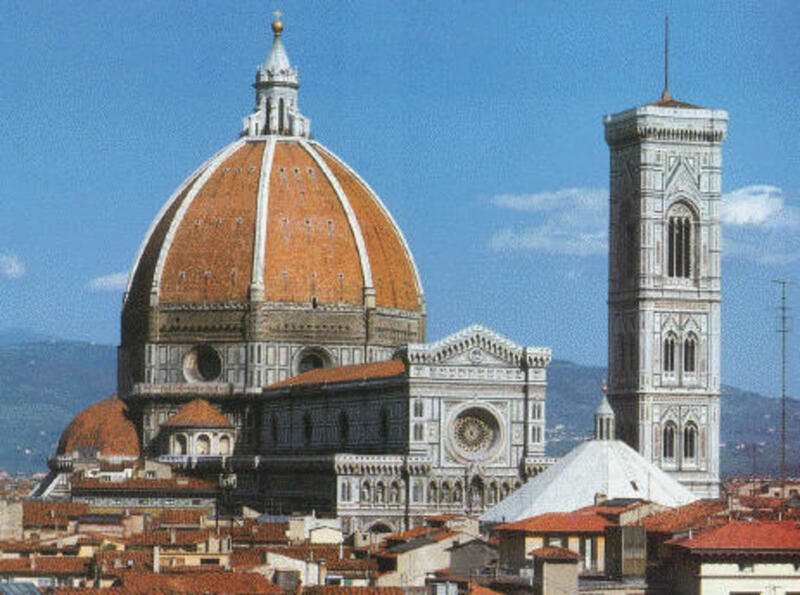 The cathedral has a long history as there has been a church on the site for around a 1000 years. During Saxon times, in the 10th century, the bones of St Werburgh were brought here and a shrine established. St Werburgh was a Mercian princess noted for the holy life she led and whose remains after her death were associated with miracles. A Norman Benedictine abbey was built on the site in the 11th century and then in 1250 the church we see today was started. It was built without first demolishing the earlier Norman one as the rebuilding was done from the inside to the outside. Unlike many other abbeys and monasteries, it escaped the ravages caused by the Dissolution of the Monasteries Act to some other churches belonging to monastic orders. Today visitors can see many of the original features from its time as an abbey church. The earliest of these, some masonry in the baptistry and, in the north transept, a large arch and the arcade above date back to the 12th century. Also in the north transept, visitors can see a richly carved beam in the roof. One of the cathedral's most beautiful features is the late 14th century choir stalls and their carved, wooden canopies. In 1541 it became the cathedral for the Chester diocese. Built of sandstone, by the 19th century it was crumbling badly and was extensively restored by architect, Sir George Gilbert Scott. He built a new organ loft and an open wooden screen between the nave and choir. The remaining abbey buildings are also a great attraction for visitors. In the cloisters, largely dating from the 16th century, the arched recesses where the Benedictine monks worked can still be seen. Visitors can now take refreshments in the 13th century refectory and look at a wall-pulpit where a monk would read to the others during mealtimes. Set in 110 acres and Chester Zoo won the Good Britain Zoo Award in 2003. It is heavily involved in breeding and conservation of rare and endangered species. The Zoo has more than 7000 animals from 400+ species over half of which are threatened and on the IUCN (International Union for the Conservation of Nature and Natural Resources) Red List. 134 species are kept as part of a managed captive breeding programme. Additionally, Chester has 265 threatened plant species. Chester Zoo works directly to protect threatened plants and animals, and their habitats, in the wild. Projects range from the support of Black Rhino anti poaching activities in East Africa to the conservation of wildlife in the Forest Reserves of China. The Zoo is still fun, though, with many special events in the summer. You can become a Keeper for a Day and work with the professional keepers. Alternatively, Become a Gardener for a Day and spend half the day working in the beautiful 110 acre gardens and the other half in the Zoo's plant Nursery. Either of these would be a very special gift for someone. The Normans built Chester Castle, once an important fortification constructed as a typical motte and bailey castle. All that remains is parts of the 12th century inner bailey curtain wall, the Flag Tower, the original inner bailey gateway known as the Agricola Tower. On the first floor of the Agricola Tower is the St Mary de Castro Chapel. During the English Civil War in the 17th Century, the castle was held by Royalists. It was attacked three times and finally besieged, along with the rest of the city, by the Parliamentary New Model Army. After the Civil War, the Castle was used as a prison, court and tax office. At the end of the 17th century there was a big problem in the country with coin clipping - that is clipping small pieces of silver off coins consequently they became much smaller and lighter while coin clippers made money from the silver. It was decided to standardize coins and, to do this, Mints were set up in a number of towns including Chester. Each Mint was overseen by a person of unimpeachable reputation. It was Sir Edmund Halley (discoverer of the comet) who oversaw the Chester Mint. Over the next 100 years, many of the Castle's buildings deteriorated leading to Thomas Harrison being commissioned to build replacements. This commission began with a new prison, because conditions were so appalling in the old one, and then continued with rebuilding the Shire Hall, barracks and armoury, all in neo-classical in style. The Castle is still in use today. The Crown Courts are there, as is the Chester Military Museum. Cheshire Military Museum in Chester Castle - This museum is principally devote to four main regiments and the Eaton Hall Officer Cadet School although it does include Cheshire's smaller regiments too. 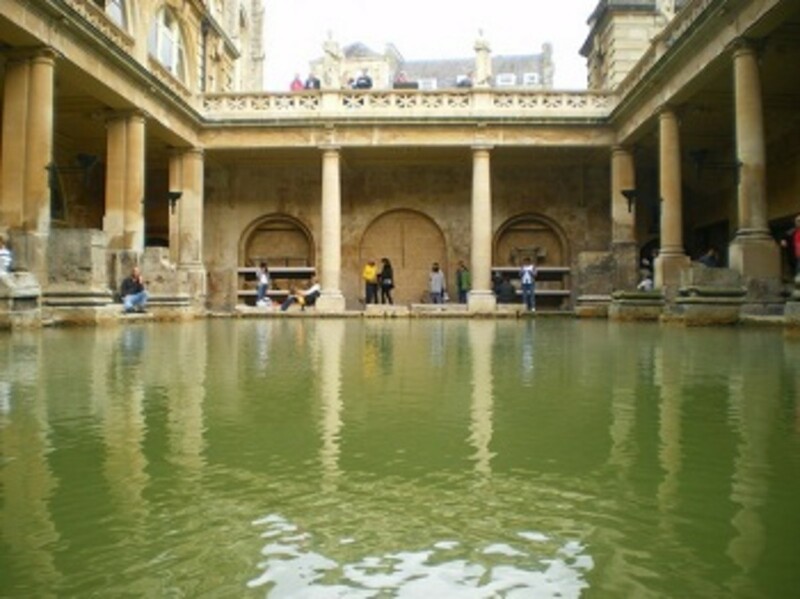 Dewa Roman Experience in Pierpoint Lane, off Bridge Street - Get a hands on experience of real Roman remains and experience a recreation of a Roman galley and street including the sounds and smells. The Grosvenor Museum in Grosvenor Street - The city's largest museum, it covers 2000 years of history, both local and international. Especially popular are the Roman exhibits and displays. 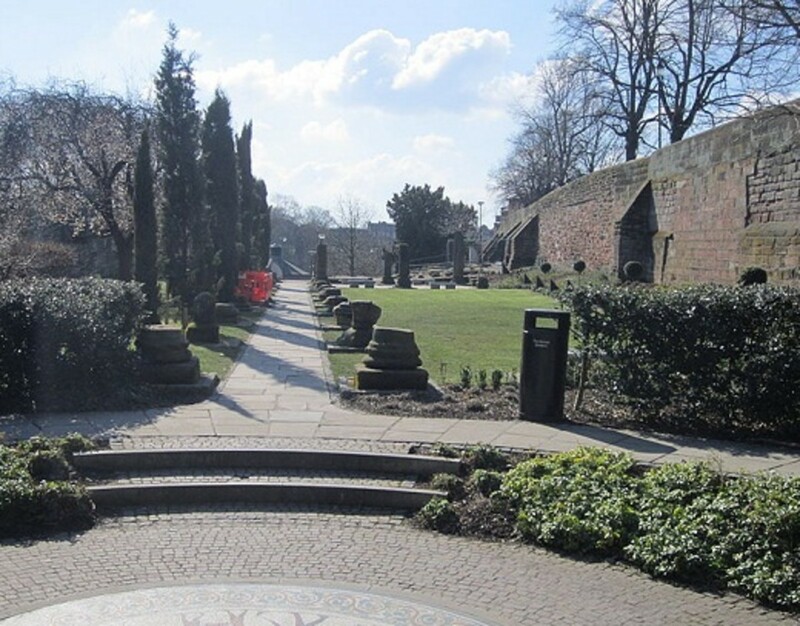 The city of Chester can trace it history back to Roman times when they established the fort of Deva (pronounced Dewa) here, now one of the country's major Roman sites. Building of the timber fort finished in 79 AD although it was rebuilt later in stone. Its purpose was principally to guard against the threat from the Ordovices in North Wales. Amongst the archaeological evidence found is a Roman amphitheatre which it is thought could have held 8,000 people and is the largest discovered in Britain. It wasn't discovered until 1929 and only the northern part has been uncovered as there are buildings, including the County Court, on the southern half. There is also a shrine to the goddess Minerva in Handbridge, a district of Chester on the south side of the river. 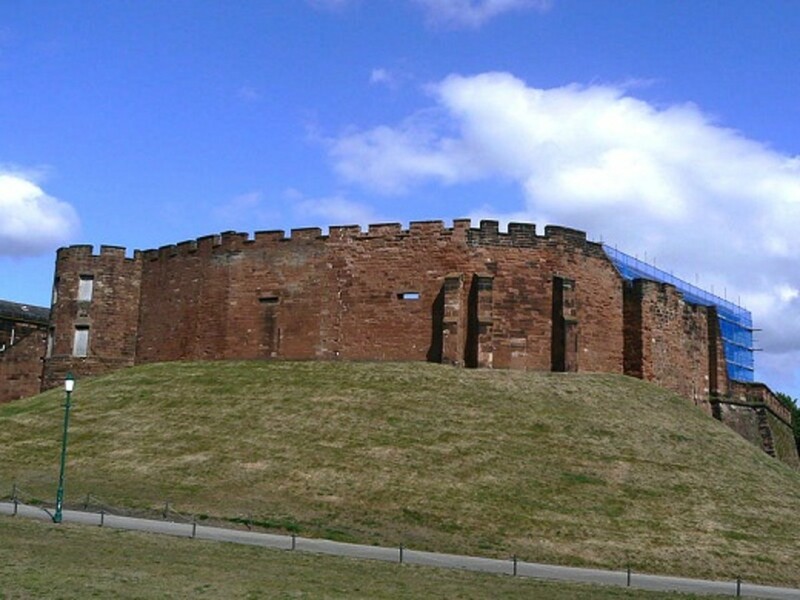 The other most noticeable Roman construction are Chester's City Walls. You can walk for two miles along the top of them with good views in all directions. This book tells the story of the Romans in Chester and how the built a fort here. Then the town grew up around the Roman stronghold. The Romans left early in the 5th century AD leaving the local people in the settlement that had grown up around the fort. At that time, Chester was a port which made it vulnerable to attacks from the sea by both the Saxons and Vikings. The Saxons eventually moved into the town and fortified it against the Vikings. 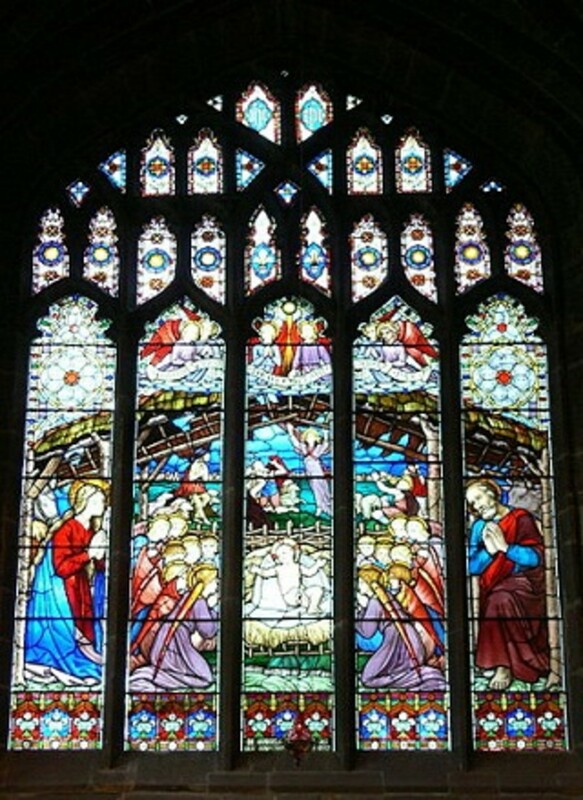 They also gave named it Ceaster, since corrupted to Chester. The Danes took the city at the end of the 9th century, using the old Roman fort as a stronghold. They were besieged by King Alfred. It was one of the last places to succumb to the Norman Invasion and suffered during 'The Harrying of the North' when people and their animals were slaughtered, buildings and crops burned and the earth salted to prevent anything growing. When the Normans came to the Chester they built its Castle (see below) and the town began to thrive and grow. 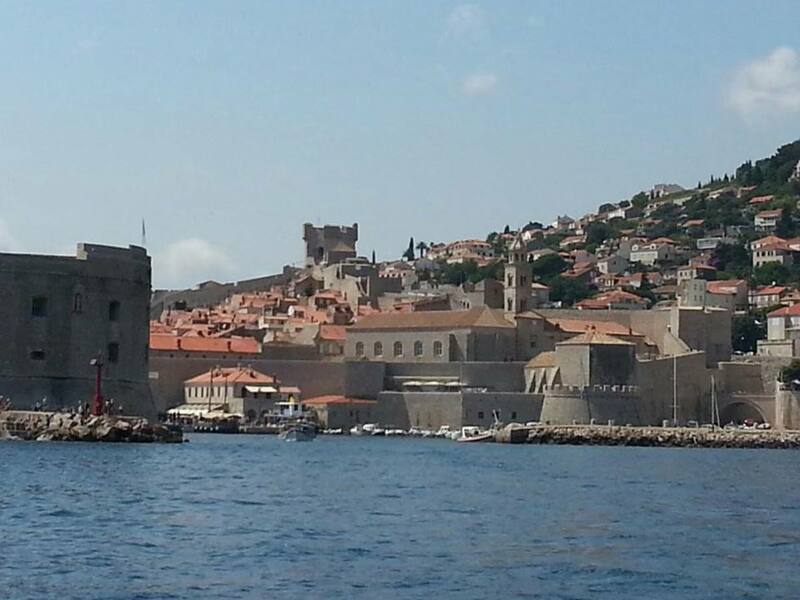 Its port contributed to it prosperity until the river started silting up in the 15th century leading to a downturn in its economy. This worsened during the English Civil War in the 17th century as Chester was under siege for two years until it surrendered. Although it had permanently lost its port, the city prospered again when the canals and railways improved trade once again although Chester never became heavily industrialised as some other places did at this time. Rather it was a desirable place to live and visit even during the 19th century. I would love to go there tomorrow, but my duties take me elsewhere. Great lens! Looks like a quaint city. I'd love to see a walled city still intact and the cathedral looks like its retained its splendor too. A city on my to visit list! My sister lived in Chester for a while but sadly she moved before I got to visit this lovely place. Happy April Fools Day! I have only passed through it - reading this I may visit one day. I had been there but only for a few hours. Now I saw what I missed but will try to go back. I can almost guarantee that this is a place we will never visit. Not because it isn't very lovely....it looks very interesting. But you see, we have a family secret and you must agree not to tell anyone. My husband's first name, which he never uses, is Chester. Ssshhh....he doesn't know I let it slip. He says he hates having a name that means fortified city. I think it might also have had something to do with a character in Gunsmoke. Any way, I am sure if I ever suggested that we visit this city, my idea would be soundly denounced. So I must visit by way of the lovely lens. I love the pictures! OMG! I don't know which one of your lenses I love best! All are wonderful, full of things I love and am crazy about! I hope I'll never have to vote for one of them because I would need a bunch of different buttons to vote for all of them! A lens full of information and photos - very inspiring! Nice Lens, very interesting. Spent many, many years in a small village just two miles outside Chester. Immigrated to London, and spent 27 years in west London, but things ain't what they used to be. I am now an Englishmen exiled in Colwyn Bay, noth Wales coastline. I'm lovin it . . .
Great Lens 5* from me and welcome to Travelmania group. 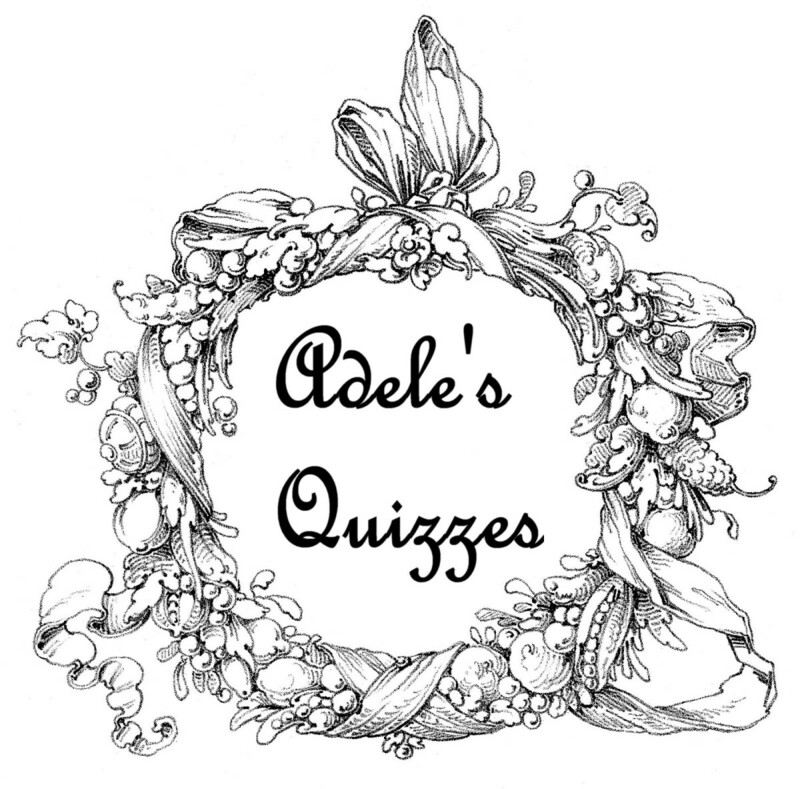 Awesome photos and illustrations. Welcome to All Things Travel.